- Got a visit from his Uncle Josh, Aunt Lauren and cousin Sawyer over the Thanksgiving Holiday. Had lots of fun playing with them. - Enjoyed his first Thanksgiving feast including turkey, ham, cheesy broccoli and rice, a roll, stuffing, green bean corn casserole, pumpkin pie and sweet potato souffle, he spit out the mashed potatoes though. Ok, mom, seriously, I want some more. - Celebrated his big sisters' second birthday in Heaven. 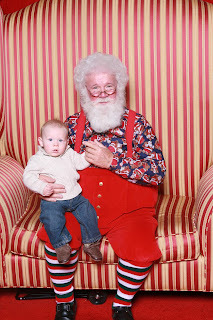 - Visited with Santa Clause for the first time! He wasn't too sure of him when Mommy walked away but was loving him when she was standing near! - Continuing to love his baths! He doesn't want to get out of them! - Went and helped mommy and daddy pick out his very first Christmas tree from the farm. First sight of the Christmas tree all decorated and lit up! * Got diagnosed with strep throat on October 20 after mommy spotted a sore on the roof of his mouth. * Went to a March of Dimes conference in Washington DC to see all of his Aunties that "met" him last year while he was still in mommy's tummy! * Celebrated his second Halloween! Last year he went as an M&M, this year he chose to be a dragon! * Visited Arbuckle Wilderness and feed all the animals there. He saw Emus, Alpacas, Donkeys, Zebras, Rhinos, Hyenas, and many other animals! * Went hiking at the Chickasaw National Recreation Area! * Learned how to pull up to standing from a seated position on October 25 using the Jaber's coffee table. * Learned how to sit up from a laying position on October 26 during nap time! With above mentioned skill, I'm now screwed! Nothing is safe! 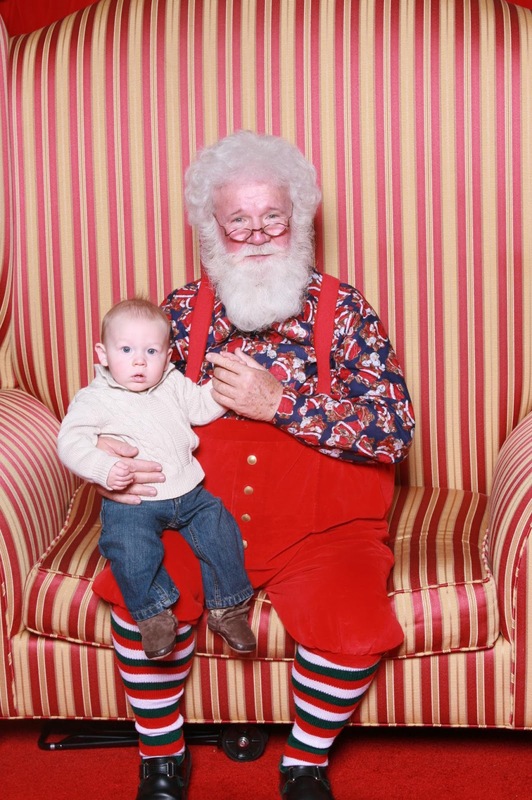 * Took his first "steps" crawling on hands and knees on November 4, only a few at a time though! * Mastered the art of cruising on November 9! Made it from one side of the couch to the other in about three seconds flat! * Can eat almost any table food you give to him! He's kinda slow at it though so we still give him some purees when he's willing and not bored with them. Kinda hard to eat much when you've only got two teeth! I'm not a very religious person. I don't go to church, I've only gone a handful of times since I was twelve. But I do believe in God. And I believe he is there for me whenever I need, and that he answers prayers. I believe that my girls are in Heaven, and that when I die I will see them again. I hope that I will get to see them grow up from the tiny babies I knew. I will always miss not seeing their first smile, first day at Kindergarten or their college graduation. I was mad at God after losing the girls, pissed beyond belief. Someone told me I could not be mad at him. I replied that yes I could, he can handle it, he's God!! Anyway, one of the things in particular bothered me in the days after losing the girls was seeing people who had their child live, and said "God answered my prayers, he is good!" Or "Have faith, and God will answer your prayers!" Things like that were a little twist of the knife already in my heart. It says that, because they prayed hard enough, God answered their prayers and saved their child. Which also implies that the reason that he didn't save my girls is because I didn't pray hard enough, or believe strong enough. In discussions with a dear angel mommy friend of mine, she hit the nail on the head, and also shared a link that I'll post below. People saying the above are both right and wrong. God didn't answer their prayers because they believed enough, or prayed hard enough. He just answered their prayers with a yes. God answered my prayers too. He just said no, or not now. He didn't kill them, he just didn't give me the miracle I so desperately wanted. I will never know his reasoning, nor do I really care because no reason here on earth could make losing my girls ok. But he did answer my prayer too, regardless of if it was the answer I wanted or not. I also prayed that if my girls were going to die anyway, to just take them then instead of having me sit in the hospital for weeks on end only for them to go into the NICU and get poked, prodded and hurt only to die anyway. To that, he said yes.